There are more insects every square mile than there are humans on this earth. The U.S wasps kill more people than snakes, spiders and scorpions altogether. 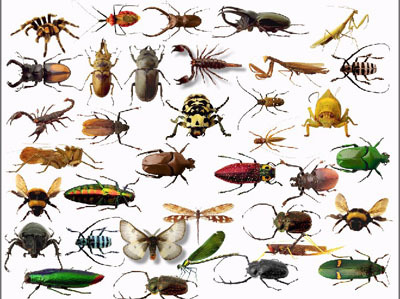 There are over 900,000 known species of insects in the world. There are more people killed each year by bees then by snakes. When insects are eaten beetles taste like apples, wasps taste like pine nut, and worms taste like fried bacon. Dragonflies only have a lifespan of twenty-four hours. A dragonfly has as many as 30,000 lenses in each eye. On an average worker ants live seven years while the queen lives as longs as fifteen years. For every human on the planet there are over 200 million insects. There are over 350,000 species of beetles known. The largest member of the insect family are beetles. The largest ants in the world measure 1 1/4 inches long and are found in Brazil. There are only one Queen bee in each hive. The Queen bee is the only bee that can lay eggs. A mosquito’s sharp proboscis is what makes a mosquito bite itch. An average mosquito has forty-seven teeth. Fleas can jump eight hundred times farther than its body length. Sometimes worms will eat themselves if they can’t find any food. Waking Sticks are the longest insects which can reach up to thirty-three centimeters. Dragonflies are the fastest known insect, which can fly fifty-eight kilometers an hour. Female ladybugs are usually bigger than male ladybugs. Ladybugs feed of of their stored fat during hibernation. A female ladybug will lay over 1,000 eggs in her lifetime. There are over 5,000 different different kinds of ladybugs in the world. There are about 400 different types of ladybugs in North America. The Goliath Beetle is the worlds largest insect, which can be as long as 4.5 inches and weigh up to 3.5 ounces. Moths and butterflies are found on all land masses except Antarctica. In the rain forests of South America there are over 2,000 species of butterflies. The Monarch butterfly is the fastest flying butterfly which can fly up to seventeen miles per hour. On an average bees can fly thirteen to fifteen miles per hour. To make one pond of honey, honeybees visit about two million flowers. There are about 45,000 bees in every bee hive. The average temperature of a bee hive is 93.5 degrees. The average lifespan of a housefly is fourteen days. Flies are attracted to heat, low wind and light. In North America there are sixty species of ants. Ants can lift an object fifty times their body weight. A tick can grow from a size of a grain of rice to a marble. It takes about 2,000 silk worm cocoons to produce one pound of silk. There are more kinds of beetles than all plant species. Walking sticks have the largest eggs of insects, some eggs can grow larger than eight millimeters. When spiders are fried it is said to taste like nuts. A spider’s skeleton is located on the outside of its body. At the end of a spiders legs are claws. There are over 35,000 species of spiders. Fireflies belong to the beetle family. On an average bees fly thirteen to fifteen miles an hour.